Stay connected to your University by joining us for Homecoming 2019! Start the weekend on Friday night at the Back Nine Tavern at Stanley Golf Course. Enjoy music, snacks, and cocktails in the newly renovated facility and deck. On Saturday, we’ve got something for everyone, from family-friendly activities and campus tours, to our famous Bloody Mary/Mimosa Brunch in Kaiser Parking Lot. 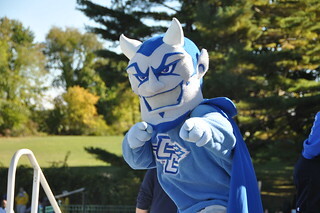 Then, it’s time to cheer on the Blue Devils. Online: The easiest and fastest way to register. Reservations must be postmarked no later than October 10. Phone: Homecoming Hotline 1-860-832-1613 during business hours 8 a.m. – 5 p.m. Have your event selections and payment method ready.